I am a postdoctoral researcher and project assistant at the DBAI group, Institute of Information Systems, TU Wien. I am part of the project A Semantical Framework for Graph-Based Argument Processing, after having worked in the projects Abstract Dialectical Frameworks: Advanced Tools for Formal Argumentation and Fragment-Driven Belief Change. In June 2017 I finished my PhD studies under the supervision of Stefan Woltran. My main research interests are in knowledge representation and reasoning, in particular (abstract) argumentation, belief revision, complexity and algorithms. PC member of TAFA 2017, COMMA 2016, ECAI 2016. Reviewing for AIJ, AI Communications, JETAI, IfCoLog, IJAR. YADF: Dynamic ASP-based system for computing acceptable sets of arguments for ADFs. UNREAL: ASP-based tool for realizability in abstract argumentation. GERD: Genteel Extended argumentation Reasoning Device, an ASP-based system for computing extensions of Extended Argumentation Frameworks (EAFs). [j5] An Extension-Based Approach to Belief Revision in Abstract Argumentation. Martin Diller, Adrian Haret, Thomas Linsbichler, Stefan Rümmele, Stefan Woltran. International Journal of Approximate Reasoning, 93: 394-423, 2018. [j4] Summary Report of the Second International Competition on Computational Models of Argumentation. Sarah A. Gaggl, Thomas Linsbichler, Marco Maratea, and Stefan Woltran. [j3] Abstract Solvers for Dung's Argumentation Frameworks. Remi Brochenin, Thomas Linsbichler, Marco Maratea, Johannes P. Wallner, Stefan Woltran. Argument and Computation, to appear. [j2] On rejected arguments and implicit conflicts: The hidden power of argumentation semantics. Ringo Baumann, Wolfgang Dvořák, Thomas Linsbichler, Christof Spanring, Hannes Strass, and Stefan Woltran. Artif. Intell., 241: 244-284, 2016. [j1] Characteristics of Multiple Viewpoints in Abstract Argumentation. Paul E. Dunne, Wolfgang Dvořák, Thomas Linsbichler, Stefan Woltran. Artif. Intell., 228: 153-178, 2015. [c11] A General Notion of Equivalence for Abstract Argumentation. Ringo Baumann, Wolfgang Dvořák, Thomas Linsbichler, and Stefan Woltran. In Carles Sierra, editor, Proceedings of the Twenty-Sixth International Joint Conference on Artificial Intelligence, IJCAI 2017, pages 800-806. ijcai.org, 2017. [c10] Solving Advanced Argumentation Problems with Answer-Set Programming. Gerhard Brewka, Martin Diller, Georg Heissenberger, Thomas Linsbichler, and Stefan Woltran. In Satinder P. Singh and Shaul Markovitch, editors, Proceedings of the 31st AAAI Conference on Artificial Intelligence, AAAI 2017, pages 1077-1083. AAAI Press, 2017. [c9] Verifiability of Argumentation Semantics. Ringo Baumann, Thomas Linsbichler, Stefan Woltran. In Pietro Baroni, Thomas F. Gordon, Tatjana Scheffler, and Manfred Stede, editors, Computational Models of Argument - Proceedings of COMMA 2016, pages 83-94. IOS Press, 2016. [c8] A uniform account of realizability in abstract argumentation. Thomas Linsbichler, Jörg Pührer, and Hannes Strass. In Gal A. Kaminka, Maria Fox, Paolo Bouquet, Eyke Hüllermeier, Virginia Dignum, Frank Dignum, and Frank van Harmelen, editors, ECAI 2016 - 22nd European Conference on Artificial Intelligence, Proceedings, pages 252-260. IOS Press, 2016. [c7] Investigating the Relationship between Argumentation Semantics via Signatures. Paul E. Dunne, Thomas Linsbichler, Christof Spanring, Stefan Woltran. In Subbarao Kambhampati, editor, Proceedings of the 25th International Joint Conference on Artificial Intelligence, IJCAI 2016, pages 1051-1057. IJCAI/AAAI Press, 2016. [c6] On the Functional Completeness of Argumentation Semantics. Massimiliano Giacomin, Thomas Linsbichler, Stefan Woltran. In Chitta Baral, James Delgrande, and Frank Wolter, editors, Proceedings of the 15th International Conference on Principles of Knowledge Representation and Reasoning (KR 2016), pages 43-52, 2016. [c5] An Extension-Based Approach to Belief Revision in Abstract Argumentation. In Qiang Yang and Michael Wooldridge, editors, Proceedings of the 24th International Joint Conference on Artificial Intelligence (IJCAI 2015), pages 2926-2932, 2015. [c4] Resolution-based grounded semantics revisited. Wolfgang Dvořák, Thomas Linsbichler, Emilia Oikarinen, Stefan Woltran. In Simon Parsons, Nir Oren, Chris Reed and Federico Cerutti, editors, Proceedings of the 5th International Conference on Computational Models of Argument (COMMA 2014), pages 269-280, 2014. [c3] Splitting Abstract Dialectical Frameworks. In Simon Parsons, Nir Oren, Chris Reed and Federico Cerutti, editors, Proceedings of the 5th International Conference on Computational Models of Argument (COMMA 2014), pages 357-368, 2014. Ringo Baumann, Wolfgang Dvořák, Thomas Linsbichler, Hannes Strass, Stefan Woltran. In Torsten Schaub, Gerhard Friedrich and Barry O'Sullivan, editors, Proceedings of the 21st European Conference on Artificial Intelligence (ECAI 2014), pages 69-74, 2014. [c1] Characteristics of Multiple Viewpoints in Abstract Argumentation. In Chitta Baral, Giuseppe De Giacomo and Thomas Eiter, editors, Proceedings of the 14th International Conference on Principles of Knowledge Representation and Reasoning (KR-2014), pages 72-81, 2014. [w9] Introducing the Second International Competition on Computational Models of Argumentation. In Matthias Thimm, Federico Cerutti, Hannes Strass, Mauro Vallati, editors, Proceedings of the First International Workshop on Systems and Algorithms for Formal Argumentation (SAFA 2016), pages 4-9. CEUR Workshop Proceedings, 2016. 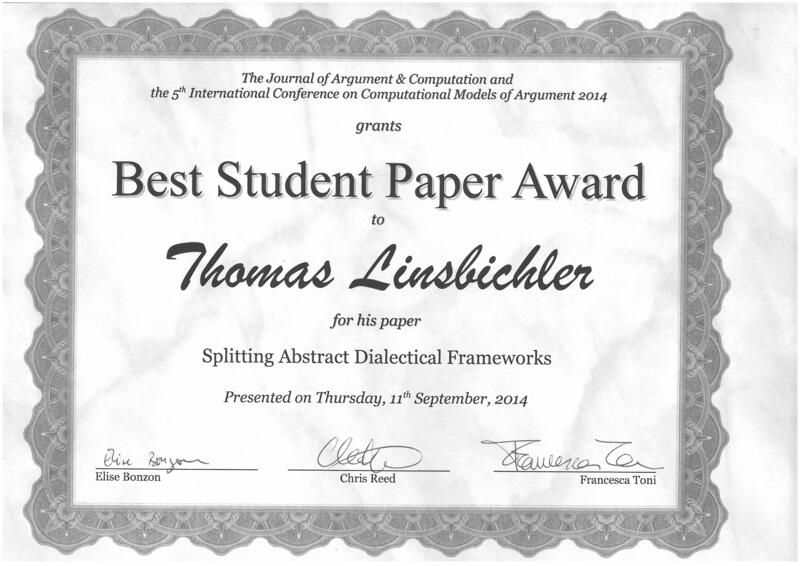 [w8] Revision of abstract dialectical frameworks: Preliminary report. Thomas Linsbichler and Stefan Woltran. In Sarah Gaggl, Juan Carlos Nieves, and Hannes Strass, editors, First international Workshop on Argumentation in Logic Programming and Non-Monotonic Reasoning, Arg-LPNMR 2016, 2016. [w7] Characterizing Realizability in Abstract Argumentation. Thomas Linsbichler, Jörg Pührer, Hannes Strass. In Gabriele Kern-Isberner and Renata Wassermann, editors, Proceedings of the 16th International Workshop on Non-monotonic Reasoning (NMR 2016), pages 85-94, 2016. [w6] Verifiability of Argumentation Semantics. In Gabriele Kern-Isberner and Renata Wassermann, editors, Proceedings of the 16th International Workshop on Non-monotonic Reasoning (NMR 2016), pages 5-14, 2016. [w5] On the Functional Completeness of Argumentation Semantics. In Christoph Beierle, Gabriele Kern-Isberner, Marco Ragni and Frieder Stolzenburg, editors, Proceedings of the 5th Workshop on Dynamics of Knowledge and Belief (DKB 2015) and the 4th Workshop KI & Kognition (KIK 2015), pages 43-54, 2015. [w4] The Hidden Power of Abstract Argumentation Semantics. Thomas Linsbichler, Christof Spanring, Stefan Woltran. In Elizabeth Black, Sanjay Modgil and Nir Oren, editors, Proceedings of the 3rd International Workshop on Theory and Applications of Formal Argumentation (TAFA 2015), 2015. [w3] Abstract Solvers for Dung's Argumentation Frameworks. In Sébastien Koniecny and Hans Tompits, editors, Proceedings of the 15th International Workshop on Non-monotonic Reasoning (NMR 2014), pages 263-272, 2014. [w1] Characteristics of Multiple Viewpoints in Abstract Argumentation. In Chistoph Beierle and Gabriele Kern-Isberner, editors, Proceedings of the 4th Workshop on Dynamics of Knowledge and Belief (DKB-2013), pages 16-30, 2013. [m3] Reduction-based Approaches to Implement Modgil's Extended Argumentation Frameworks. Wolfgang Dvořák, Sarah A. Gaggl, Thomas Linsbichler, Johannes P. Wallner. In Thomas Eiter, Hannes Strass, Miroslaw Truszczynski and Stefan Woltran, editors, Advances in Knowledge Representation, Logic Programming, and Abstract Argumentation. Essays Dedicated to Gerhard Brewka on the Occasion of His 60th Birthday, pages 249-264, 2015. 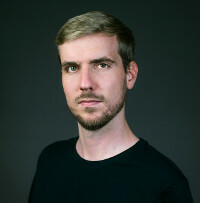 PhD thesis, supervised by Stefan Woltran and Wolfgang Dvořák, TU Wien, Institute of Information Systems, 2017. [m1] On the Limits of Expressiveness in Abstract Argumentation Semantics: Realizability and Signatures. Thomas Linsbichler (supervised by Stefan Woltran and Wolfgang Dvořák). Master's Thesis, Technische Universität Wien, 2013.